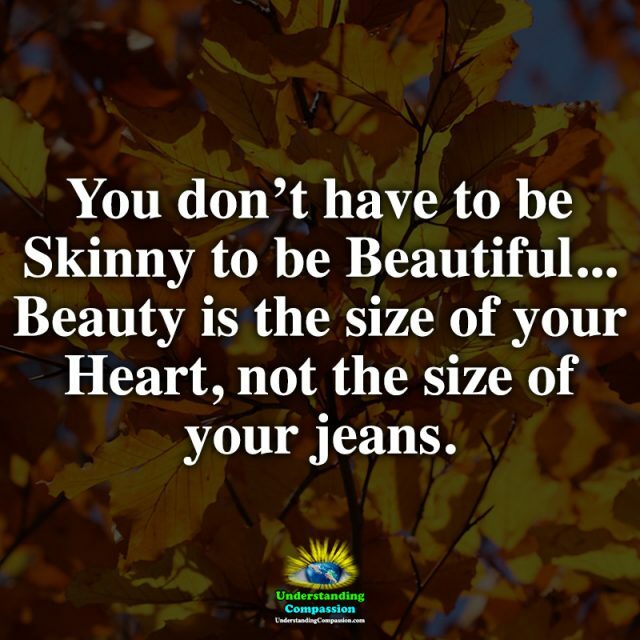 You don’t have to be Skinny to be Beautiful... Beauty is the size of your Heart, not the size of your jeans. A pretty face gets old, a nice body will change, but a Good Woman will always be a Good Woman. Her children were tired, needing milk and on the verge of a meltdown, when she dropped the milk she had just bought. An older woman in the parking lot saw this, then came up to her and insisted on buying her more milk, then came back with two gallons and a gift card. She wouldn’t accept any payment, and only said, ‘Happy new year.’ Kindness Is Beautiful. A Child is Like a Butterfly in the wind, some can fly higher than others; but each one flies the best it can. Why compare one against the other? Each one is Different! Each one is Special! Each one is Beautiful! Family isn’t always blood. It’s the people in your life who accept you for who you are. The ones who would do anything to see you smile, and love you no matter what. A Strong Woman may remain silent when people talk behind her back. But that doesn’t mean she doesn’t notice. It simply means she chooses not to waste her energy on foolishness. She has more important things to do. 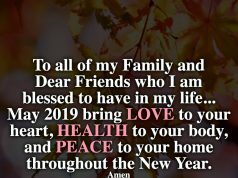 A True Friend doesn’t care if you are rich or broke, if you wear fancy clothes or jeans, if your house is clean or messy… they have your back and love you for being who you are. A lot of walking away will do your life good. Walk away from arguments that lead you to anger and nowhere. Walk away from people who deliberately put you down. Walk away from the practice of pleasing people who choose to never see your worth. Walk away from any thought that undermines your peace of mind. Walk away from judgmental people, they do not know the struggle you are facing and what you have been through. Walk away from your mistakes and fears, they do not determine your fate. The more your walk away from things that poison your soul, the healthier your life will be. 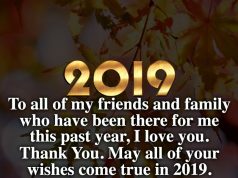 At the end of the day, what really matters is that your loved ones are well, that you’ve done your best, and that you’re Thankful for all you have. 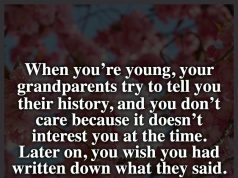 Previous articleWhen you’re young, your grandparents try to tell you their history, and you don’t care because it doesn’t interest you at the time. Later on, you wish you had written down what they said.